We’d love your help. Let us know what’s wrong with this preview of Scream All Night by Derek Milman. Dario Heyward knows one thing: He’s never going back to Moldavia Studios, the iconic castle that served as the set, studio, and home to the cast and crew of dozens of cult classic B-ho A darkly hilarious contemporary realistic young adult novel about growing up and finding your place in the world, perfect for fans of Me and Earl and the Dying Girl and Running With Scissors. To ask other readers questions about Scream All Night, please sign up. I'm not really Pam..it's complicated...I'm really Doug...and I just wanted to say "What a great title! ", which I tried to say but said comment was rejected by the page, which said "your question needs to contain a question mark", and so...Great title..makes me want to read the book! Sincerely, Doug? Derek Milman Thank you? I hope you enjoy the book? With Love? Derek? Why you are not displaying the whole novel ??? Where to begin? I don’t think I’ve had the pleasure of reviewing a novel that’s been so unique in all my time of reading. Most of my friends here know that I gravitate toward the darker side of literature, so it’s no surprise that a YA dark comedy turned out to be right up my alley, but there is something really special about this one. Is it a contemporary? Yes. Is it disturbing? Absolutely! While difficult to pin down into a single classification, I decided to make my own: Scream All Night is a deeper look at the reconciliation of a dysfunctional family full of unusual storytelling and unsettling behavior. If you’re wanting just a little bit more than the blurb offers (let’s face it, this is a very specific type of story for a very specific type of reader), let me offer you a brief summary of chapter one. Dario is a 17-year-old guy who has had a really unusual childhood. He grew up on the private grounds of his father’s B-rated horror film studio called Moldavia Studios. After a beyond neglected childhood, Dario has become emancipated from his family and is living in a group home where, he’s not living as affluently but is supported by a few friends who care about him. When he receives a call to return home for his father’s live funeral (that would be a gathering where the terminal father is buried alive), Dario decides he needs to return home once and for all to come to terms with his past and put his demons to rest. To say the story begins with a bang might be an understatement. I’m ashamed to say that I wasn’t expecting the intricate exploration of grief and family dynamics in general here. I thought this would be a fun romp for sure, but surface level entertainment at best. Needless to say, Scream All Night was indeed much more. I felt Dario’s heart break with every disappointment that was flung his way, along with the neglect and abuse he suffered as a child stuck in a world of selfish adults. As he is forced to work through the death of his estranged father and all the regrets that bubble to the surface, there is also a great deal of forgiveness and reconciliation that occurs between multiple “family” members, both blood related or by choice. I think readers who enjoy bold plots that fall into a category of their own will really take to this one. Scream All Night is not for the faint of heart, but for readers who are searching for a novel with its own dark flair, stop searching-this is it! Highly recommended! Moldavia Studios is the creepy castle safely tucked away from the world by a large gate to protect a colorful, odd group of people all happily suffering from a dissociation from reality. Moldavia has proved to be a haven for generations of eccentrics, but what will happen to all these people if their sanctuary crumbles to dust? Dario Heyward is the younger son of the grand master of Moldavia Studios and the director of every Moldavian feature film... Lucien Heyward. Dario leaves the Studios to escape his father, even going so far as to declare himself a ward of the state rather than be in any way under the power of his family. Every time he thinks about his family he gets hives. He is lured back to the Studios, which you will have to read the book to discover how that is exactly accomplished. Believe me, it is an explosive affair that had me thinking with my Moldavia Studios hat on,...did anyone get that on tape? So I am looking at Dario with a skeptical eye. Oh boo hoo, you don’t like your parents. Oh boo hoo, you are a B movie acting icon. Oh boo hoo, you had an unusual childhood that I would have loved to experience. I mean, OMG, horrifying things just drop from the ceiling. How cool is that? So let me switch with you, Dario. Lucien Heyward is a perfectionist. To watch his films, you wouldn’t really get that impression. They are B-movies after all, rife with imperfections to the critical eye with over-the-top blood splatter, plot holes the size of the Grand Canyon, and implausible characters, but he has a vision in his mind of what the film is supposed to be. If he isn’t getting what he wants from an actor, he uses manipulations, some of them downright cruel. With Dario, he took it further. Yes, the C is intentional. Meanwhile, college is waiting for Dario (what a dickhead, he got into Harvard). Things with his girlfriend Hayley are up in the air, but mostly fine. (He left at 12 and really didn’t talk to her until he was 17, and now things just pick back up? I believe it; she is his soulmate, after all. I must say the casualness with which these Generation Zs conduct their relationships is rather baffling to me.) Another studio wants to buy Moldavia, and there are a lot of zeros on the offer, but Moldavia will be turned into a horror Disney World, and the sanctuary that has kept so many misfits safe over the years will be nothing but a memory. Dario has a way to save it, but it will mean reprising his starring role in Zombie Children of the Harvest Sun and dredging up all that fear, pain, and anxiety that is twined around his memories of that movie, like the slithering tentacles of a Cthulhu monster. Yeah, he is going to have to contend with his feelings for good old Dad. I don’t usually read YA, but I do have a soft spot for Hammer films and B movies of all sorts. Whenever I find a new gem of the genre, I have a few friends with a similar freakish interest with whom I can share my excitement. The movies have all kinds of problems, but the reason I watch them is to find those wonderful creative moments where they get something really right. They make me feel the terror of my own exposed mortality. They have me wrestling with unusual moral dilemmas. They sometimes even make me believe in monsters. 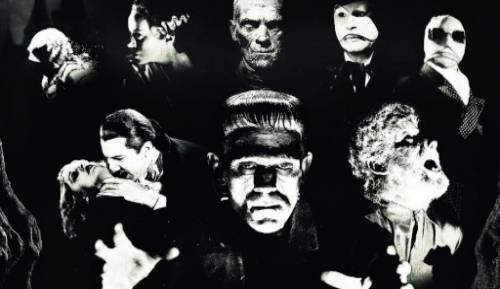 Derek Milman has given the classic horror genre a reverential nod with this book. I really like the idea that all those misfits have a place like Moldavia Studios to be as crazy creative as they want to be. Those misfits do what they do, not for money or even fame, but because they need to see what is in their head unfold before them in the celluloid universe. Sometimes as a writer, I'll read a book that I believe to be perfect in every way and, even though I love it, I also kind of hate it because I'm incredibly jealous of the author's skill to write something so flawless. Scream All Night by Derek Milman is one of those books. The story follows 17-year-old Dario (yes, named after the Italian Giallo-film director) who grew up in Moldavia Studios, a literal spooky castle owned by his film-director father. Moldavia filmed and produced many, many cult ho Sometimes as a writer, I'll read a book that I believe to be perfect in every way and, even though I love it, I also kind of hate it because I'm incredibly jealous of the author's skill to write something so flawless. Scream All Night by Derek Milman is one of those books. The story follows 17-year-old Dario (yes, named after the Italian Giallo-film director) who grew up in Moldavia Studios, a literal spooky castle owned by his film-director father. Moldavia filmed and produced many, many cult horror films that remind me very much of what Hammer Studios made in the '60s and '70s. Growing up in a place like this sounds like a dream-come-true for me, but for Dario it wasn't everything that met the eye. His childhood was incredibly painful, so much so that he fled at age 14 to live in a group home. Now, Dario is being lured back to Moldavia, and he must face the past he's been running from for so long. Scream All Night has everything I love: creepy castles, nods to classic horror films, film-making, dark humor, laugh till you cry dialogue, wacky characters, plenty of heart, and raw emotion that shows how deeply the author connected to his story while writing. I teared up multiple times, sometimes out of sadness, other times out of laughter. But the novel, overall, has a bittersweet quality that reminds me very much of books by Rainbow Rowell. Simply put, it is a beautiful story about selflessness, growing up, facing your past, and moving forward. God, I loved this book. I really, truly did with every ounce of my being. I give Scream All Night by Derek Milman 500 out of 5 gothic castles and my Cameron seal of approval! NOTE: I don't usually give trigger warnings in my reviews because, as you probably know, I read mostly dark stories as it is. However, since I'm talking about how funny this book is, I should mention it isn't always funny. There are some very dark, very serious themes of child abuse and mental illness here. The scenes, however brief, are a bit anxiety-inducing (as they should be). While I feel it is important for books to include themes like these and that they shouldn't be ignored, I also want to warn anyone who is sensitive to these subjects. The book is a hysterical romp, but do expect emotional depth here as well. You can check out my video review HERE. This was a perfect Stephanie book. Our main character Dario Heyward was raised in a gothic castle that was also the set for many b-horror movies that his famous father directed (basically my fantasy life). After some traumatizing events he is legally emancipated from his parents and now lives in the Keenan group home, but as he returns home he find himself getting roped back into the world of Moldavia. I loved the idea of this character having to go and face his past, deal with difficult (quirky) family and cast members, and decide what a family legacy means to him. There was a lot of meat and depth to Dario's story. There is a bit of the story that is dedicated to the technical part of movie-making that I didn't find quite as interesting as the rest of the book. People who love nods to pop culture (especially old creature-feature horror movies) and movie making will love this. Can a story be both completely absurd and cuttingly poignant? Well, apparently yes. Enter SCREAM ALL NIGHT, which is as much a campy celebration of weirdness as it is a thoughtful character study of a kid who's been dealt a seriously rough hand in life. Even when it's at its most surreal, this book still manages to seem relatable, in part because Milman's writing never shies away from the emotional core of the story, and because main character Dario serves as our brilliant, damaged, and bigheart Can a story be both completely absurd and cuttingly poignant? Well, apparently yes. Enter SCREAM ALL NIGHT, which is as much a campy celebration of weirdness as it is a thoughtful character study of a kid who's been dealt a seriously rough hand in life. Even when it's at its most surreal, this book still manages to seem relatable, in part because Milman's writing never shies away from the emotional core of the story, and because main character Dario serves as our brilliant, damaged, and bighearted anchor to reality. Given that the book has been compared to Jesse Andrews and Andrew Smith, I was a little worried that Dario was going to devolve into an icky horny-teenage-boy-narrator stereotype. But that couldn't be farther from the case. Dario comes off as a realistic teenage boy without ever objectifying or degrading the women in his life. Imagine that! I could go on all day about how much I love Dario but, for me, his bizarre older brother Oren really steals the show. Anyone who's spent time with creative people has known an Oren--one of those artistes who's full of big ideas but can't quite seem to string them together in a way that makes sense. One of those people who's so out of touch they struggle to function in anything resembling the real world (Kanye anyone?). Oren could've easily become a joke in this book, but Milman is such a talented writer he instills Oren with layers and dimensions that dovetail beautifully with all of Dario's complexities and hangups, and with all of the weirdness that is Moldavia, a unique setting that is basically a character in and of itself. So I'm not a horror aficionado by any means but...I dabble. And I can assure you that all the horror references in SCREAM ALL NIGHT are legit without being show-off-y or obnoxious. In one early scene, main character Dario notes that his private bathroom in Moldavia castle has lighting meant to imitate the lighting in films by his namesake, Dario Argento. Anyone who's ever seen an Argento film will immediately be able to picture this bathroom and it's a clever little nod to the Italian horror legend, but won't annoy readers who've never heard of him. Hi, hi there, I'm Derek! I wrote SCREAM ALL NIGHT. First off, there will be signed ARCs and giveaways and scavenger hunts and me coming over to your house to watch horror movies with you and your family (OK, maybe not that last thing, unless there's free pizza involved). Anyway, check my website for updates about fun stuff like that, as well as some FAQs about the book. Also, if you wish, follow me on Twitter and IG! @DerekMilman. 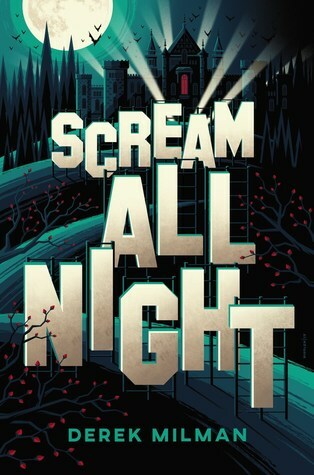 SCREAM ALL NIGHT is a YA contemporary, a dark comedy, about 17-year- Hi, hi there, I'm Derek! I wrote SCREAM ALL NIGHT. SCREAM ALL NIGHT is a YA contemporary, a dark comedy, about 17-year-old Dario Heyward, who grew up surrounded by fake ghosts n' goblins n' ghouls at Moldavia--his family's giant castle, which doubled as an infamous B-horror movie studio. But Dario, already a nervous kid, had a pretty hard time there, especially after his father made him a cult icon by casting him as the main zombie kid in Moldavia's Zombie Children of the Harvest Sun. That did not go well for Dario, and he learned monsters aren't only in horror films. They come in many forms. Dario got legally emancipated from his rather unusual family, and moved into a group home, rooming with a kid named Jude, an amateur boxer with a checkered past (and over time they became best friends). But then Dario's eccentric brother, Oren, calls him back to Moldavia because their father is dying...and suddenly it's up to Dario, who has his own future to consider, to save the family legacy he only wanted to escape from. Think: Jesse Andrews, Andrew Smith, early John Irving, Jonathan Tropper's occasional dalliances with the screwball, Running with Scissors, Nightfilm, and Arrested Development--but with a sprinkling of gothic glee, of course! There is the aforementioned castle, with all the large rooms doubling as sound stages. There is naive, dangerously ambitious Oren, who appears to dress (and exist) in a Moldavia movie that was never made. There is Gavin, a dour child butler, with secrets of his own. There is Mistress Moonshadow (and her flying rig), Moldavia's famous vamp, who stalks the halls of the castle at night (and sometimes people's ceilings). There is Hayley, Dario's lost (and one true?) love who pretty much runs the studio now. There is even a very tall "creature actor", seldom seen, who appears only after being transformed into one of Moldavia's latest monsters. There is a movie about "killer cauliflowers" that spins wildly out of control, a monthly costume ball called Crepuscular Dusk, a duel, a fraught romance, crystal skulls, calla lilies, a terrifying cup of tea, a revenge horror film, a touching tale of sentient zombies, the unearthing of lots of dark secrets, and in the middle of it all, our hero, Dario Heyward, trying to figure out who he is, and who he wants to be. YES, Moldavia Studios, as whacked-out as it sounds, has a couple of real-life inspirations. Troma films, which made The Toxic Avenger for one, Cannon Films, but mostly Hammer Horror films, a British film company, which actually did move all production to an English manor house in the 1950's, called Bray Studios. You can read more about that here and here. There is even a book devoted to all their cool posters: Art of Hammer. Everyone at Moldavia lives and works in the castle, churning out creature features at a frenetic pace. People's lives are totally subsumed by the studio, and the small repertory company of actors there (known as the Spine Tinglers) hardly know who they are as real people anymore. As Dario himself says: "it takes true misfits to make believable monsters." 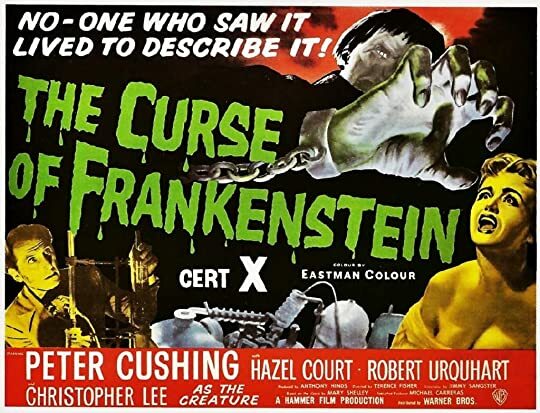 Similarly, Hammer Films ALSO had a repertory company of actors with cult followings such as Oliver Reed, Christopher Lee, and Peter Cushing (who would go on to Star Wars fame). I am so thrilled to share my YA debut with you all! I sincerely hope you enjoy it. SCREAM ALL NIGHT releases tomorrow, and it's time for me to let go of this story and hand it over to the world, as thrilling and scary as that is. Thank you to all the bloggers and reviewers who took the time to review my debut, and get the word out. Thank you to everyone who sent me Q&As, or had me as a guest on their blog. Thank you to everyone who recommended this book to someone else. Truly, I cannot thank you enough. Tell us about the elements of your teenage experience you bring to the story and what was the research and execution process like for the human side of things. This book has one of the more unique premises I've read in the Young Adult genre. It gets a bit diff Moldavia is a huge castle on the Heyward estate that also serves as a studio for the family's B-horror movie company, Moldavia Studios. Following an odd childhood of starring in his father's films & enduring his abuses, Dario has become emancipated & currently resides in a group home. The verdict: Don't miss this amazing debut! Unique and complex, SCREAM ALL NIGHT is a story of a reluctant heir to a movie empire at peril. Come for the love of horror movies, stay for the coming-of-age story of facing down your childhood demons. Oh, and all the quirky jokes! The book deals with some heavy topics, too, but handles those well and in a respectful manner. P.S. Finishing this book has left me with this unquenchable thirst to establish my own horror movie studio AND to live in a cast The verdict: Don't miss this amazing debut! Unique and complex, SCREAM ALL NIGHT is a story of a reluctant heir to a movie empire at peril. Come for the love of horror movies, stay for the coming-of-age story of facing down your childhood demons. Oh, and all the quirky jokes! The book deals with some heavy topics, too, but handles those well and in a respectful manner. P.S. Finishing this book has left me with this unquenchable thirst to establish my own horror movie studio AND to live in a castle. Update 15/Mar/18: I'm approaching the halfway mark here and just wanted to say, BRAVO, Mr. Milman, you have achieved what no other author has achieved before: you made me laugh out loud in public AND almost miss my train stop on the way to work! While the latter has been done before (by Courtney Summers and Judith Butler, to be precise), the former has never been accomplished. Until now! SCREAM ALL NIGHT is a gift to humanity! One of the most unique YAs I've read in a long time! The setting - a castle where protagonist Dario's father has filmed dozens of B-horror movies - is creepy and quirky and deeply immersive. Film is one of the toughest mediums to write about because it's so visual, but Derek Milman truly brings it to life. SCREAM ALL NIGHT gave me major Clue and Rocky Horror vibes; fans of those types of cult classics will gobble up this book. I recently read Derek Milman’s captivating Scream All Night. One part Royal Tenenbaums and one part Running With Scissors, it tells the story of the heir to a horror movie studio forced to return to the castle/lot where he grew up and was subjected to very real horrors by his family members. Sure to be an instant hit, this book is both hilarious and sobering. SCREAM ALL NIGHT has everything I love: human monsters; laugh out loud hilarity (seriously, so hilarious); dark emotional backstory; a sweet meaningful love; great friendships; interesting characters and killer setting (pun intended); and uniqueness for miles. Plus, it all takes place in a castle that makes B grade horror movies and everyone is a bit bananas. I love this book, hurt for the characters (so much hurt, I wanted to hug them so badly), and had such a great time reading. HIGHLY RECOMMEN SCREAM ALL NIGHT has everything I love: human monsters; laugh out loud hilarity (seriously, so hilarious); dark emotional backstory; a sweet meaningful love; great friendships; interesting characters and killer setting (pun intended); and uniqueness for miles. Plus, it all takes place in a castle that makes B grade horror movies and everyone is a bit bananas. I can't remember the last book that made me laugh this hard, but under the wild zombie makeup this story has a beating, compassionate heart. I will be foisting this with great glee upon all my Rocky Horror-loving weirdo friends who played screaming heads and chainsaw killers at the local Haunted Barn - but I think anyone will recognize Dario's struggle to face his monsters and claim his place. Before reading SCREAM ALL NIGHT, I’d heard it was a hilarious, campy, slightly creepy and fascinating tribute to B-horror movies. And don’t get me wrong, it completely delivered on all of these things. But I wasn’t prepared for it to emotionally wreck me the way it did! Hiding in the cobwebbed corners of this wonderful book are some tender, heart-wrenching, completely beautiful moments, and these were my favorite parts of the story – they both surprised and completely gutted me. OK, a little more Before reading SCREAM ALL NIGHT, I’d heard it was a hilarious, campy, slightly creepy and fascinating tribute to B-horror movies. And don’t get me wrong, it completely delivered on all of these things. But I wasn’t prepared for it to emotionally wreck me the way it did! Hiding in the cobwebbed corners of this wonderful book are some tender, heart-wrenching, completely beautiful moments, and these were my favorite parts of the story – they both surprised and completely gutted me. The book mostly takes place within the walls of Moldavia Studios, located on the grounds of a Rocky Horror-esque castle - Milman does an incredible job of building this eerie and enchanting world. Readers will be dazzled by the operations of the movie studio, from the carpenters to the electricians, to the wardrobe department – if you’re even remotely interested in the behind-the-scenes world of film and TV, this book is worth the read for these parts alone. The haunting studio is somehow equal parts repelling and entrancing all at once, and its inhabitants, including Dario, have a difficult time leaving the grounds once they arrive - I was getting some serious Sunset Boulevard, Ed Wood and The Disaster Artist vibes in the best way. I'm a bit surprised about that one, because I ended up enjoyin it more than I thought I would! It had tons of interesting characters and relationships, a great focus on family and good character development for our main character. I really enjoyed the original setting of the studios, some moments made me laugh for sure. I wasn't totally on board with the romance in that book, but loved the best friends vibes. Dario is about to turn 18 is living voluntarily in a group foster home after legally emancipation himself from his family. But now his father is dying and the fate of the family's B Horror Movie empire rests in Dario's unwilling hands. Can he handle the ghosts, both literal and figurative, and return to the castle/movie studio home or will he ditch the kooky family and head to Harvard? Scream All night is one of those books that takes you late into the night, losing track of time, because you can not put it down! It's clever and well-written, funny and sad, and thoroughly enjoyable. I loved a peek into the movie-making world, and the characters are so fully developed I feel like I know them personally, like I might see one of them in an upcoming B-horror flick! I also loved how the family dynamics and dysfunction felt very, very real. Great book! Derek Milman's Scream All Night is one of those books that I can't get out of my head. I've read it a couple of times now, and it grows richer and deeper each time. On the surface, it's a dark comedy. But as you delve deeper into the world, there is a tragic, almost gothic (in both the traditional literary sense, and the "goth" sense) story lurking underneath the farcical scenes of filmmaking chaos and the wry commentary of our hero, Dario Heyward. At first glance, you might think Dario has an e Derek Milman's Scream All Night is one of those books that I can't get out of my head. I've read it a couple of times now, and it grows richer and deeper each time. On the surface, it's a dark comedy. But as you delve deeper into the world, there is a tragic, almost gothic (in both the traditional literary sense, and the "goth" sense) story lurking underneath the farcical scenes of filmmaking chaos and the wry commentary of our hero, Dario Heyward. At first glance, you might think Dario has an enviable life. Legally emancipated from his family, and living with his best friend Jude in a group home, Dario has a bright future ahead of him. But a phone call beckoning Dario back to the creepy castle he grew up in (that serves as set and studio for his father's infamous B-horror creature features and home to dozens of actors and crew members) sets the plot into motion. After a literally explosive first chapter, Dario finds himself with a dilemma on his hands, and responsible for the livelihood of Moldavia Studios and its many employees. If choosing a college is a challenge at seventeen can you imagine finding yourself weighed down with the responsibility of dozens of people depending on you to make the right decisions, and to quite literally save them from financial disaster? One of the central relationships that hits home and gives the book depth and poetic beauty is the story of Dario and his dramatic, over-the-top, eccentric brother and rival, Oren. Oren believes himself to be a misunderstood genius whose filmmaking career will revolutionize horror movies. But Oren's belief in himself doesn't necessarily reflect reality. Dario is put in a position where he has to choose between hurting his brother and saving a lot of other people. The choices he makes are tough and painful, but hopefully, provide a path for the redemption of his family legacy and his relationship with Oren. Dario's first love, Hayley, also lives and works at Moldavia Studios, and the deep friendship and shared history of the two is a touching storyline that could be explored again down the road if Milman ever wants to revisit Moldavia (I hope he decides to one day.) Hayley is a fierce, strong, and funny character who is one of the most compelling voices in the novel. She's much more than a love interest. She's a force of reason and an anchor for several of the main characters, but she has dreams of her own. Dario and Hayley are clearly soulmates, and the progression of their story is lovely and fragile. This book really surprised me. Not only did it have the horror movie setting, but it was funny and touching. First a few warnings for abuse from a parent, mental illness, drug abuse,and miscarriage. There are also parts that are pretty gory while discussing the movies. I think most people requesting this are probably ok with gore though. Dario is a 17 year old kid living in a group home. He left his family home at 12 because of abuse and neglect. His family home was Moldavia where all his dad This book really surprised me. Not only did it have the horror movie setting, but it was funny and touching. Dario is a 17 year old kid living in a group home. He left his family home at 12 because of abuse and neglect. His family home was Moldavia where all his dad's horror movies were filmed. Dario's dad was much older when he was born, and his mom was already having issues with mental illness. She was eventually committed. His dad was very abusive with Dario, especially while filming. Dario is doing well in the group home, especially with his best friend, Jude. He tries to avoid everything from home. But his brother, Oren, and old friend, Haley, call to tall him that his dad is dying and he needs to come home. Against his better judgement, Dario returns home from his dad's funeral. The only problem is that his dad isn't dead. His wish is to be buried alive. Things don't go quite as planned and Dario ends up coming back for the summer. But he brings Jude with him. Dario has to deal with all the issues from his past while learning to get along with Oren, falling for Haley again, and trying to figure out what his future will be. I don't want to give anything away, but I was surprised at how sad parts of this book was. There were so many broken people in this book. But one bright spot for me was Oren. He was definitely one of the broken people, but he was so outrageous. I laughed out loud so many times. But I also wanted to hug him. I also loved the setting for the book. Derek had a great way of making me feel like I could imagine everything about the castle and the movies that were made there. I love horror movies, so this was perfect. I ended up giving this book 4 1/2 stars (rounded up to 5 on goodreads). Thank you to HarperTeen and Edelweiss for giving me a chance to read this one early. I love horror films and so-bad-there-gold ones are a staple of the genre. Milman takes monster movies, gratuitous gore, ridiculous logic and not only writes a love letter to the genre, but weaves a truly impactful story about abuse and the lingering effects it has on a person. It's dark, it's hopeful, and it's got just the right amount of ridiculousness to make me smile right when I needed it. Scream All Night follows Dario as he's called back to his childhood home/failing B-movie studio in an old castle Moldavia for his father's burying alive/funeral, which is a hilariously tragic and utterly dramatic way to go that I wholeheartedly approve of. But, Dario's plans to get in, pay his respects, and peace out are derailed when his father wills him the entire studio on the condition he stays on the ground and gives the studio what they've been lacking, a financial success. The strongest points of this book are twofold. The first is the setting, which is utterly GOREgeous. Every description is dripping with decrepit old glamour that I just adored. The ballrooms, the sets, the gardens are all described with such vivid love that I couldn't get enough of them. Moldavia felt stunningly real and I grasped at every scene I could get. The second is Dario. Specifically his journey and arc throughout the story. Sure, his character is good if not a little bland for my taste. But he was clever and he cared not only about his family, but the actors and crew he came to think of as family. However, he really shines in the introspective scenes where he's confronting the abuse he suffered at the hands of his father. There's a lot of hard storytelling in those scenes, where you want to turn away and never look back, but you always do. Milman explores not only the relationship between an abusive parent and their child, but the relationship between abused siblings with Dario and Oren. And as annoyingly hilarious Oren was, he did have a genuinely upsetting character and backstory that I think worked really well as a contrast to Dario. I wasn't really expecting Scream All Night to be about abuse, but works. The setting, the characters, it all works to create this darkly sinister atmosphere that also feels like a home. My only real problem with the story as a whole is the tone. I love dark comedies and while there are some darkly funny moments, the tone didn't, in my mind at least, match up to other dark comedies I've read. However, that might be a good thing as a more comedic tone would've most likely weakened Dario's journey as a whole. Unlike anything you've ever read. I wouldn't be surprised if this is the next big thing in YA honestly. ARC provided by edelwiess in exchange for an honest review. Trigger warnings for mental illness and child abuse. wasn't expecting was the abuse that Dario suffers as a child and the mental illness representation. This book is an interesting and quick read. This is one of the most unique Ya book I've ever read! Dario Heyward is a teen boy living in a group home after legally emancipating himself from his family. His father, the famous mastermind behind a horror movie production company Moldavia Studios,he leaves the entire studio to Dario in his will. He is given six months to make a profit or he is to sell to another studio. Oren, Dario's older brother has an idea for a movie but it is not well thought out, the crew dose not want to continue with his film. castle! I loved Dario as a character,he was clever and cares about his family and friends. He struggles with coming to terms with his childhood trauma,and his relationship with his brother. Oren, is such a different character, hes quirky and he struggles to put his thoughts together. I loved reading about him,he was a bit problematic but he works on repairing his relationship with Dario. Happy Thursday Night Owls! 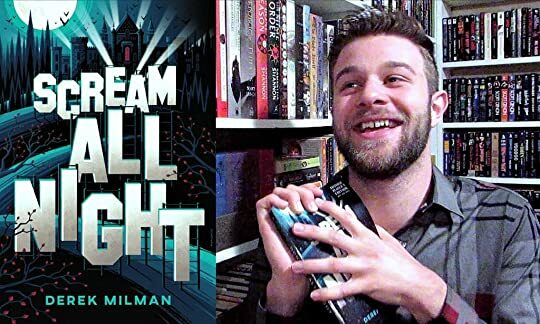 You guys are in for a treat today because I’m finally sharing my review of Scream All Night by Derek Milman. He was kind enough to send me a copy of his debut novel, and I’m so happy he did because I loved this book so much. It also happens to be released on my birthday, which is July 24th. You guys should pick it up on its release date because you’ll love it. 4.5/5 stars from me! In this novel, we follow Dario Hayward, whose family runs Moldavia Studio. Moldavia was a Happy Thursday Night Owls! 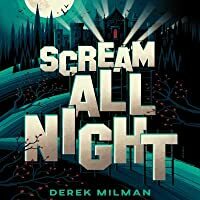 You guys are in for a treat today because I’m finally sharing my review of Scream All Night by Derek Milman. He was kind enough to send me a copy of his debut novel, and I’m so happy he did because I loved this book so much. It also happens to be released on my birthday, which is July 24th. You guys should pick it up on its release date because you’ll love it. 4.5/5 stars from me! In this novel, we follow Dario Hayward, whose family runs Moldavia Studio. Moldavia was a studio responsible for many cult-classic B-level horror movies. It’s also a castle so it makes sense that horror movies are made there. Dario has come back to Moldavia because his brother, Oren, invited him for a special ceremony honoring their father and his first film. Dario promised himself that he would never return to the studio. He would also have to face his first love, Hayley. This all changes when Dario has been offered the studio in his father’s will. I loved this book so much! In the beginning it was a little slow, but by the fourth chapter it really picked up. Dario was interesting character to read, but Hayley had to be my favorite character. So Derek, if you’re reading this, please give us more Hayley. Whether it’s a statement, novella, or a sequel, please give us more Hayley. Night Owls, if you love horror movies, sarcasm, and creepy movie studios this is your book. On July 24th, go out to your local bookstore and buy yourself a copy. This book is perfect to read during a summer storm. You could also save it for October in preparation for halloween. One of the most original contemporary YA concepts I’ve encountered in ages. The prodigal son of a family horror dynasty comes back for the funeral of his father...who’s not actually dead yet. For there, the novel tackles tough questions about family, loyalty, mental illness and whether or not we can ever truly escape our pasts. NOTE: This book has not yet been released. I was given a free Advance Reading Copy by HarperCollins and Edelweiss in exchange for an honest review. This book will be released on July 24, 2018. If you would like to send me an ARC, please see this page. Even though I don't watch horror regularly -- I'm too easily freaked out by jumpscares -- I have always had a soft spot for Hammer horror films. And, as you can probably guess from that summary, this book was heavily inspired by the schlocky horror NOTE: This book has not yet been released. I was given a free Advance Reading Copy by HarperCollins and Edelweiss in exchange for an honest review. This book will be released on July 24, 2018. If you would like to send me an ARC, please see this page. Derek studied English, Creative Writing, and Theater at Northwestern University. He began his career as a playwright (his first play was staged in New York City when Derek Milman was born in New York City, but grew up in Westchester, NY, where he wrote and published a successful underground humor magazine that caught the attention of the New York Times, who wrote a profile on him at the age of 14. Scream All Night is Derek's debut YA novel. Swipe Right for Murder is his second novel for young adults, and it will be out August 6th, 2019, from Little, Brown/jimmy patterson. Derek currently lives in Brooklyn where he is hard at work on his next book. PLEASE NOTE: For professional reasons (not personal ones) I no longer accept friend requests on Goodreads. Feel free to follow my author page on here, or connect with me on Twitter or Instagram: @DerekMilman. “The sun is up now, revealing all of us for what we really are.